… comprises assets and liabilities of the Eurosystem national central banks (NCBs) and the ECB held at year-end vis-à-vis third parties. You can read the ECB Guidelines relating to its Balance Sheet practices – HERE. Here is the most recent ECB Balance Sheet graph for its Assets composition (from 1999 to 2018) evaluated as at December 31 in each calendar year. The following legend shows the values as at December 31, 2008 and December 31, 2018. The obvious and well-known fact is the growth in Securities of euro area residents denominated in euro – nearly 10 times the holding that the ECB had in 2008. These are collected internally by the ECB within its ILM: Internal Liquidity Management dataset. These assets include government bonds, corporate bonds and asset-backed securities. The following graph shows the evolution of these sub-categories from 1999 to 2018. The reason for the dramatic increase in ECB holdings of Item 7 Assets relates to the sequence of quantitative easing programs that the ECB has introduced, dating back, first, to the Securities Market Program (May 2012). The next graph shows the proportion of Item 7.1 assets in total ECB assets. From zero holdings in 2008, by the end of December 2018, they constituted 56.4 per cent of total ECB assets. The obvious question is why did the normal operations of monetary policy and specifically liquidity management (reserve maintenance) require such a dramatic accumulation of assets after 2009? When the ECB introduced its first QE-type intervention in May 2010 – the so-called Securities Market Program (SMP) – several Member States were on the brink of insolvency. The ECB accelerated their purchases of Member State government bonds at times when the difference between the yields on some Member State government bonds against the benchmark bond, the German bund (the ‘spreads’) were widening significantly. The initial spike in purchases from May 2011 was associated with the escalation in spreads on bonds issued by Greece, Ireland, Portugal and Spain. A second, larger acquisitions began in August 2011 and were mostly associated with the sharp rise in the spread on Italian government bonds, which went from 1.5 percentage points in April 2011 to a peak of 5.2 percentage points in November 2011. The large-scale ECB buying stabilised the Italian bond spreads by the end of 2011 and by April 2014, they had fallen back to 1.77 percentage points. Given the size and importance of the Italian economy to Europe, the ECB was clearly not going to allow the Italian spreads to rise as quickly or as far as the Greek spreads had risen. The SMP purchases effectively allowed the relevant governments to ignore the bond markets, which meant that the size of the spreads were moot anyway. After the SMP was launched, a number of ECB’s official members gave speeches claiming that the program was necessary to maintain normal monetary policy operations (liquidity management). … a functioning monetary policy transmission mechanism by promoting the functioning of certain key government and private bond segments. This was to quell criticisms, from the likes of the Bundesbank and others, that the program contravened Article 123 of the Treaty of the European Union. In early 2011, the fiscally-conservative boss of the Bundesbank, Axel Weber, who was being touted to replace Jean-Claude Trichet as head of the ECB, announced he was resigning, ostensibly in protest of the SMP and the bailouts offered to Greece and Portugal. I noted in my 2015 book – Eurozone Dystopia: Groupthink and Denial on a Grand Scale – that Weber breached ECB protocols by publicly criticising the SMP program. … blurring the different responsibilities between fiscal and monetary policy. As the risks associated with the SMP outweigh its benefits, these securities purchases should now be phased out permanently as part of our non-standard policy measures. He clearly knew that the bond purchases were nothing to do with the daily liquidity management and reserve maintenance procedures of the ECB but had, instead, become a default fiscal intervention to fund Member State deficits and keep these governments from insolvency. Another ECB Executive Board member, Jürgen Stark also resigned in protest over the SMP in November 2011. Stark told the Austrian daily, ‘Die Presse’ that the ECB was heading in the wrong direction by pushing aside the crucial no bailout clauses that provided the bedrock of the EMU. Weber’s successor as head of the Bundesbank, Jens Weidmann maintained the criticism, albeit in a more muted manner. One of the severest forms of monetary policy being roped in for fiscal purposes is monetary financing, in colloquial terms also known as the financing of public debt via the money printing press. In conjunction with central banks’ independence, the prohibition of monetary financing, which is set forth in Article 123 of the EU Treaty, is one of the most important achievements in central banking. Specifically for Germany, it is also a key lesson from the experience of the hyperinflation after World War I. This prohibition takes account of the fact that governments may have a short-sighted incentive to use monetary policy to finance public debt, despite the substantial risk it entails. It undermines the incentives for sound public finances, creates appetite for ever more of that sweet poison and harms the credibility of the central bank in its quest for price stability. A combination of the subsequent expansion in money supply and raised inflation expectations will ultimately translate into higher inflation. Whatever spin one wants to put on the SMP and its later QE incarnations, it was unambiguously a fiscal bailout package. Weidmann was correct in that sense. The SMP amounted to the central bank ensuring that troubled governments could continue to function (albeit under the strain of austerity) rather than collapse into insolvency. Whether it breached Article 123 is moot but largely irrelevant. The QE reality was that the ECB was bailing out governments by buying their debt and eliminating the risk of insolvency. QE demonstrated to everyone, that the ECB was caught in a bind. It repeatedly claimed that it was not responsible for resolving the crisis but, at the same time, it realised that as the currency-issuer, it was the only EMU institution that had the capacity to provide resolution. The SMP saved the Eurozone from breakup and the later versions maintained the solvency of governments. QE was never about giving the banks more money to loan out. Bank lending is never constrained by a lack of reserves. Rather lending requires credit-worthy customers seeking loans. At the height of the crisis as banks tightened their lending criteria in the face of increasing financial uncertainty, there was a dearth of such customers. QE is just an asset swap designed to bid up the prices of assets in certain maturity ranges and thus keep interest rates in those maturity segments lower. The only way it would have helped alleviate the crisis is if the lower rates stimulated investment growth. However, with the crisis so deep and consumers hunkering down for fear of unemployment and insolvency (given the debt overhang), firms have been able to satisfy demand with existing capacity. Weidmann’s inflation fears were unfounded and reflected the fact that German economists (in the main) and economic policy makers have become locked in a time warp that centres on the 1920s. While the SMP saved the Eurozone from breakup, it remained a failed vision for European prosperity because it didn’t address the core problem: Southern Europe was in depression and the only way out is for fiscal deficits to expand. The ECB clearly signalled a willingness to buy unlimited quantities of government bonds if there was the risk of insolvency. But this intervention required that the countries succumb to a fiscal austerity package that ensured their growth prospects are minimal. In this blog post – Monetary policy has failed – we must reprioritise fiscal policy (February 5, 2019) – I discussed the ECB failure to meet its most basic legal responsibility – to meet its price stability targets. The definition is clear enough and certainly allow some latitude around the 2 per cent target in the short run. But, equally, the definition would certainly exclude systematic departures from the target over an extended period. 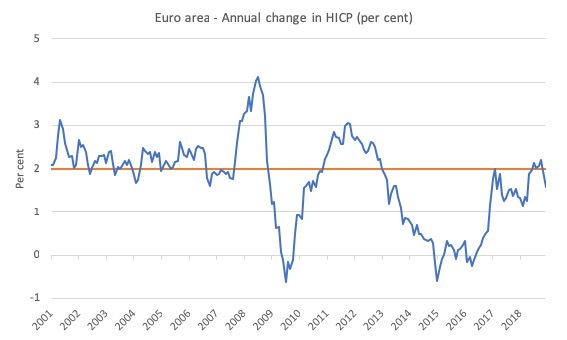 The following graph shows the annual inflation rate (Harmonised Index of Consumer Prices – HICP) from January 2001 to December 2018 – the span of the euro to date. And, the most recent data release from Eurostat (April 1, 2019) – Euro area annual inflation down to 1.4% – tells us that March 2019, inflatin has dropped even further to 1.4 per cent and if we exclude energy it is down to 1 per cent per annum. Given the lack of concerning commentary from the ECB and the sort of boast epitomised by previous ECB bosses (such as Jean-Claude Trichet) that the euro and the ECB has been a “success”, one interpretation is that the ECB is content with maintaining a deflationary bias in contradistinction to its stated monetary policy objective. So the specific lack of correspondence between the actual Euro area inflation rate and the ECB’s price stability target provide us with evidence that the Euro area has been wallowing in a low growth environment, contrary to claims by Euro officials that the euro has been a “historic success” in terms of promoting strong real growth. Here were the questions I provided for the journalist to ask Sabine Lautenschläger. I should note that Ms Lautenschläger is a lawyer by background and has no training in economics. She entered the central banking world via the Bundesaufsichtsamt für das Kreditwesen, which is the German federal body that supervises the banking system, then into the Deutsche Bundesbank, before being rolled into the ECB Executive Board. The justification for the various QE programs provided by the ECB has been that it is about liquidity management (open market operations). The fact is that anyone who knows anything about the scale of bond buying necessary to ensure effective liquidity management would realise that the scale of the QE interventions were many multiples larger than was necessary. In other words, the ECB was trying to assuage its Brussels partners to ensure them that they were not violating the no bailout clauses of the Treaty while they were obviously bailing out and funding Member States deficits in violation of the Treaty. In June 2012, would Italy have become insolvent had not the ECB started funding its deficit, albeit via secondary bond market purchases. How do you respond to that fact? Isn’t it true that the ECB is in fact the default fiscal authority in the EMU and is the only reason the Eurozone has survived to date? The primary bond market dealers know that they can fund the governments directly and then off-load the risky debt to the ECB in the secondary markets? Isn’t it true that the only reason the Eurozone has survived to date is because the ECB has broken the law by funding Member States’ deficits? Doesn’t this point to the fact that the architecture of the EMU is flawed at the most elemental level? Talking about time warps – ask a lawyer a straightforward question that is obviously seeking to put something on the public record and you get a convoluted answer about outer space! On March 27, 2019, Austrian journalist András Szigètvari interviewed ECB Executive Board member Sabine Lautenschläger for his newspaper, the Vienna-based Der Standard. I won’t consider the whole interview, bizarre as it was. Rather I will just focus on the part of the interview I might have helped frame with the questions I provided (above). She was asked about the ECB’s record in meeting its inflation target when it has “now bought government bonds and other securities amounting to €2.6 trillion” and “the ECB has fallen short of 2% for years”. Again, we had to respond to the risk of deflation; and we have come nearer to our aim of maintaining an appropriate level of inflation over the medium term … That will push up prices. But it is slower than we had thought. So no real answer at all. Then the interview moved on to the area I had pointed the journalist towards. Q: One serious criticism of the ECB’s programme is that it is effectively only subsidising the southern crisis countries. The central bank has pushed interest rates down. Without this life-saver, Italy would have gone bankrupt long ago and the euro would have been history. A: Hold on a moment. All have benefited from the measures. The savings for taxpayers resulting from lower interest rates were nowhere as high as in Germany. So avoiding the obvious and actual reality. Q: But isn’t it also true that the ECB is indirectly financing governments here? Any creditor who invests in Italian or Spanish government bonds knows that the ECB will buy these bonds off them in the future. A: Even though I am not the strongest advocate of our government bond purchases, we do not finance individual governments with them, directly or indirectly. Our aim is to maintain price stability. Thanks to our bond purchases, interest rates go down and loans become cheaper, primarily benefiting households and businesses. Besides, we have a very clear set of criteria for the timing, selection and volumes of our government bond purchases. Our parameters ensure that the private market for government bonds remains intact. One sign of the continuing relevance of this market is the divergence in the prices for German, Italian and Spanish government bonds. 1. They indirectly funded government deficits via the secondary market purchases. The primary dealers knew they could offload any amount of government debt they had bid for at a profit because the ECB was a huge buyer in the secondary market. That is why the yield spreads fell back towards the German bund yield once the QE programs began. That is why the primary bond dealers didn’t extract a massive risk component and kept buying the risky debt – because they knew they would capital gains virtually immediately by offloading to the ECB. 2. They did not maintain price stability (as above). 3. The reason that in recent months the spreads on Italian and Spanish government debt rose in 2018 is because the ECB confected a crisis to help the European Commission keep both Member State governments in check. I analysed these purchases in detail in this blog post – ECB continues to play a political role making a mockery of its ‘independence’ (June 12, 2018). The new Italian government was sworn in on June 1, 2018. In July 2018, the European Commission demanded that Italy cut its fiscal deficit to 0.6 per cent of GDP. The Italian government responded with a revised fiscal target for deficit of 2.4 per cent in 2019, which began a process where the full austerity tyranny of the European Commission was brought to bear. Ultimately (by December 2018), the Italian government submitted – it had not exit threat to bargain with. Here is what was happening with the ECB’s PSPP in relation to purchases of Italian government debt as the dispute with the European Commission was in full swing. It is also why spreads rose quickly during the standoff period. 4. The QE programs did not have to rupture the “private market for government bonds” in order to finance government deficits. The ECB was certainly funding deficits but also leaving enough paper in the secondary market to facilitate trading among private dealers. Q: The role of government debt is now the subject of heated international debate. One argument that comes up more and more often is that the significance of debt has been systematically overestimated. Large countries with their own central banks have no need to worry. Japan and the United States, two countries that are highly indebted but nonetheless pay low interest rates, often serve as examples. A: That is impossible in the euro area, for purely legal reasons if nothing else. We have set maximum limits on the Member States’ levels of deficit and debt. And the ECB cannot buy government bonds on the primary market, for example bonds which other market participants no longer want because of, say, doubts about the sustainability of a country’s debt. We can only purchase government bonds on the secondary market to a limited extent and only if such a purchase is absolutely necessary to maintain price stability. These are the legal conditions. The “purely legal reasons” didn’t stop the ECB funding government deficits indirectly in the way I described above. Everyone knows what went on. To hide behind the claim that the Treaty forbids the ECB buying bonds in the primary bond auction don’t alter the fact that the QE programs distorted the primary auctions because even though the Member States were at high risk of insolvency, which would normally have meant the private dealers would not fund the governments in question, the fact that they knew the ECB would buy massive volumes of the debt in the secondary market, altered their risk perceptions. Highly risky Member State debt became virtually zero risk for the private dealers and came with a healthy capital gain, all courtesy of the ECB violating the Treaty in spirit if not in strict law. And the on-going claim that the ECB “can only purchase government bonds on the secondary market to a limited extent and only if such a purchase is absolutely necessary to maintain price stability” is disingenuous. The earlier QE defenses (note above) were about liquidity management. Now, they are claiming they were trying to inflate. At any rate, I thought this example on-going denial of reality was an interesting exercise. It is sort of a game – do one thing that everybody can see yet say it is another thing. Amazing deception and deeply embarassing. An interesting commentary. Central bank comunication IS central bank policy. Never expect a central banker to say something that would endanger the efficacy of their policy measures or damage the credibility of the central bank. Clearly, the Euro has put the member countries into something that is akin to a gold standard constraint. Living with this contraint can be very unpleasant. Now ways have to be found to weaken this contraint without admitting that in reality they would prever to get rid of it altogether. Either you just came up with a very popular MMT description of the Eurozone by yourself, or you have read up a bit on it. Indeed, the way the Currency Union is built, it is doomed to fail. I’m no Bill but I’ll offer my take regardless. Just from the Wikipedia entry it seems to be a relatively loose term for a financial regulation approach that considers the financial system itself as a possible source of instabilities (endogenous as opposed to exogenous risk). Furthermore, it differs from the microprudential approach in that its focus lies in the system of financial institutions instead of the health (stat of risk) of individual institutions. After reading for 15 minutes, I’m hardly an expert. Still, its implementation seems to involve more regulation and I tend to think that some regulation in the financial sector is better than none. However, I fear that this could easily be an effort by monetarists to keep their “monetary-policy-only” approach to government/central bank policy alive. I’m sure Bill will offer an insightful view, but in this case it might be interesting to hear what Bill Black has to say. There is a hanging “There” with no sentence following it. I am hoping that the missing sentence (or more) will explain more about the crisis that the ECB confected. We obviously come from completely different schools of thought, but the fact that the Eurozone is mis-conceived is undeniable. Ralf Dahrendorf was absolutely right when he wrote in 1997 that the EUR is likely not to unite, but to devide the European countries. That much is cristal clear. Which roughly translates to the content of this post, namely that national governments have an ever decreasing role in financial and monetary policy and blame their futility on the banks financial impositions. He also foresaw the austerian measures that would have to be adopted by many countries and the increase in inequality across Europe as a result of the currency union. Dirk said:- “…in reality they would prever to get rid of it altogether”. “They” in this context seems to be referring to the eurozone member-countries, and “it” to be a “gold standard constraint”. What’s the evidence that Germany wants to get rid of that, considering that A) it’s baked-into the German constitution and B) Germany has constantly pressed for it to be baked-into everybody else’s too (the Fiscal Compact)? After all, isn’t a “gold standard constraint” the only thing standing between Germany and the ever-present likelihood of another Weimar hyper-inflation? There’s a direct causal link between the behaviour pilloried in this article and Bill’s earlier one “The German undervaluation obsession is resistant to ‘reform’”. The casuistical gyrations (lies, bluntly) through which spokespersons for the ECB are forced to put themselves are the direct result of the tacit conspiracy, to steadfastly avert their eyes from the elephant in the room, to which the entire top echelons of the EU are party. Namely:- Germany’s deeply-entrenched regime of “competitive undervaluation” – to use Höpner’s phrase (“beggar-my-neighbour” in its more homely version) – persisting over nearly seven decades now. As Höpner’s paper conclusively shows, it is that which dooms the entire eurozone to permanent and chronic debility with no end in sight. Yet there is nothing but deafening silence about it from the EU. Why? Because no one dares to take-on Germany; instead they blame, and sanction, only the victims of Germany’s calculated predation while keeping up a farcical charade that all is for the best in their best of all possible currency-unions. And also because Germany cannot rid itself of its own pathological compulsions. I’m sorry to say that Bill got it about right:- “Germany – a most dangerous and ridiculous nation”. Were it not for the occasional shining beacons of sanity like Martin Höpner one would despair. with or without QE that central banks cannot control inflation. in the way economic theories conceived . There is no coherent inflation model. ECB buying “massive volumes” of member states debt that are highly at risk of insolvency, (which private dealers wouldn’t touch with a barge pole, because they knew this was the case,) strongly suggests to me that the ECB’s own balance sheet must be highly suspect. i.e The ECB itself must be technically insolvent!? The fundamental problem is the true value of the asset (i.e the debts) side of the balance sheet. If private dealers are/were not prepared to touch these, then by implication theses assets are worthless! Any commercial bank would be forced to obtain new capital to offset the lack of value in the assets, or face going bust. Why is the ECB not constrained by this practicality?